Dedicated Message window when a player enters the game. Thread: Message window when a player enters the game. Message window when a player enters the game. Hello comrades. 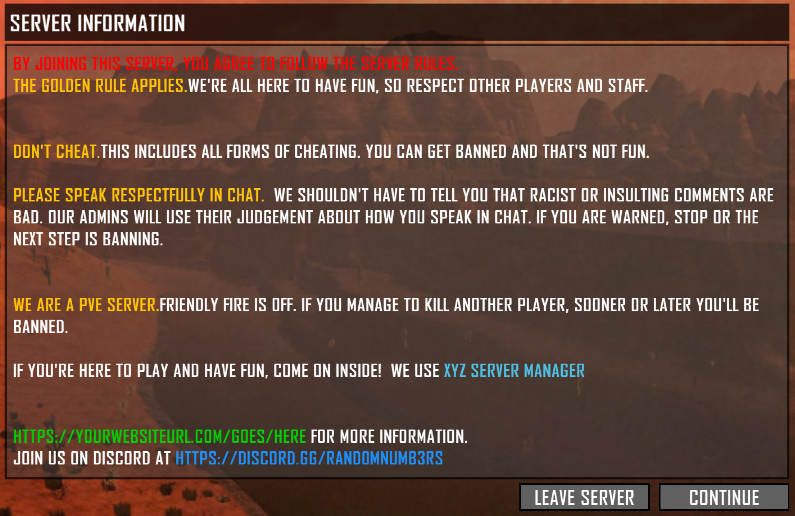 I went to one server, and there is a message box with server rules. And two buttons accept and reject. I want to make a window with rules on my server too. But I dont know how. Tell me what is it? What is the mod or server setting? It's in the server config.xml. [FFC300]The Golden Rule applies. [-]	We're all here to have fun, so respect other players and staff. [FFC300]Don't cheat. [-]	This includes all forms of cheating. You can get banned and that's not fun. [FFC300]Please speak respectfully in chat. [-]  We shouldn't have to tell you that racist or insulting comments are bad. Our admins will use their judgement about how you speak in chat. If you are warned, stop or the next step is banning. [FFC300]We are a PvE server. [-]	Friendly fire is off. If you manage to kill another player, sooner or later you'll be banned. Here's what that code above looks like in-game. It is very strange that it does not support Cyrillic. Although on other servers I saw the message in this window in Russian letters. Is it possible to somehow change the font or encoding? The linebreaks did not working for me. I don't believe changing the font is possible. No code. Just have it in the config file exactly like that.